I picked up some light pumpkin ice cream the other day, which is probably one of my favorite flavors. For some reason, I haven't been able to stop thinking about making it into an ice cream sandwich, with a fresh ginger cookie. I have and often use my Grandmother's old cookbook, which is basically a collection of our church's Rosary Society Member's favorite recipes. While I'm often dismayed by ingredients such as "lard", I still head to that book before pa rousing the internet for a recipe. There is something to be said about creating a recipe 20, 30, 40 years later in the same way my Grandmother and some of her dearest friends once did. And since I only have few memories of cooking with my Grandmother (which mostly involve mashed potatoes and getting to clean a beater from her stand mixer) I hold onto this book tightly. 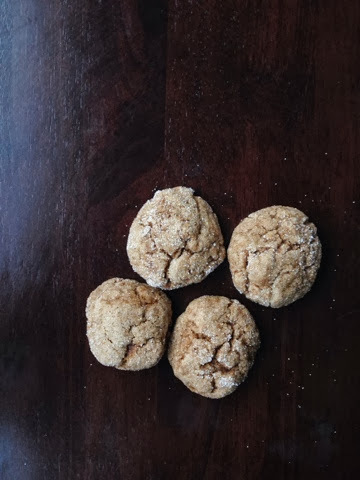 I found a lovely recipe for ginger cookies, but I substituted the lard for some softened unsalted butter. Do stores sell lard? Do people still make their own lard? I'm not sure I could use it, it's just not very appealing. I'll stick with butter and vegetable fats for now. I'm really into photographing my food, and I loved catching the melting ice cream from the fresh, warm cookie after making these cookies. I'm learning how to capture foods/photos with my iphone thanks to some fantastic posts and an instragram iphone lesson published weekly over at Annapolis and Co, which I highly recommend you checking out if you get a moment. You won't be disappointed! Plus, she has lots of great recipes on her site, the granola bars are awesome. They've become a staple at our house. But while we're craving something a little more sweet, it's usually a cookie. Which turned into a lovely Friday night around here. Sift together flour, spices and salt in a large bowl. In a separate bowl, beat butter, brown sugar and molasses until soft and fluffy, about 3 minutes. Beat in egg until combined. Add half the dry ingredients and mix, alternating with 1/2 cup buttermilk until combined. Roll into tablespoon sized balls and coat with white sugar. Place on baking sheet and into oven. Bake for 12 minutes, until tops are cracked, but cookies are still soft. Allow to cool on baking sheet for about 5 minutes. 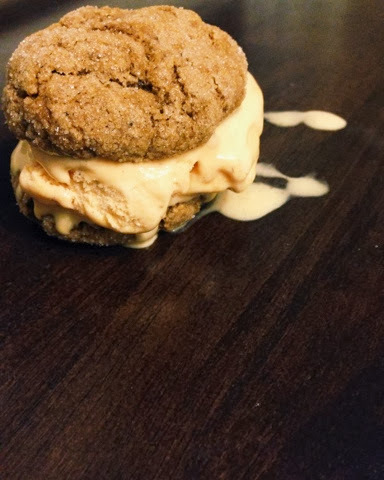 When cookies are cool to touch, add a heaping spoonful of your favorite ice cream (we used a store bought pumpkin ice cream) between two cookies. Enjoy quickly, it's a messy, but delicious treat! Times around here are a changin'. We're in the midst of colored leaves, cooler weather, and a vacant garden except for some winter squash. The farm is hustling around harvesting their corn and preparing for soy bean harvest. And I'm in the opening stages of a new job. This is my 3rd job in 4 years. I don't say that with pride, but with hope and exhaustion. I've been working at an acute care clinic for the past year, and it was such a pleasant change from my previous position. I work 12 hours shifts, and only 3 per week, so that has allowed me the chance to be a stay-at-home Mom, if only part time. And oh, I've enjoyed those 4 days per week home with Molly. 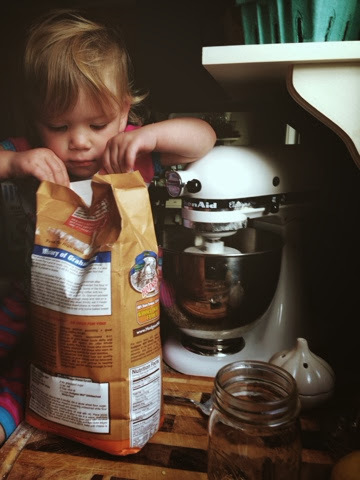 And I've loved the extra time for cooking and baking. But the days are long, and it's hard on Molly. And it's hard my my husband. And it's so hard for me. I can't imagine having a new baby with this job, and being away for 12 or more hours. We miss dinners and weekends together. I've missed several family parties and holidays. And I've missed Primary Care. But it's back to Monday-Friday, and the world of the working Mom, which I have grown to dislike. But we've prayed about this, and we really feel that we're moving in the right direction. To get some more debt paid off, to eat dinner together everyday. I think this is a part of His plan. But I'm going to miss the multiple step meals I've grown accustomed to preparing 4 days a week! And this one, is by far, my favorite to date. We planted some butternut squash this year, and they are just beautiful. But wow, I didn't feel like I missed my workout today- those things are a chore and a half! I wanted to dice the butternut squash, to get all sides caramelized while roasting. And that meant a lot of work. This dish is something I pretty much threw together as I was thinking (drooling) about my favorite meal at Bravo-- it's a stuffed pasta with diced sauteed sweet potatoes and brown butter sage sauce. It's fantastic. So I tried to replicate it, minus the stuffed pasta and subbed the sweet potato for butternut squash. It was still a huge hit around here! Preheat oven to 400F. 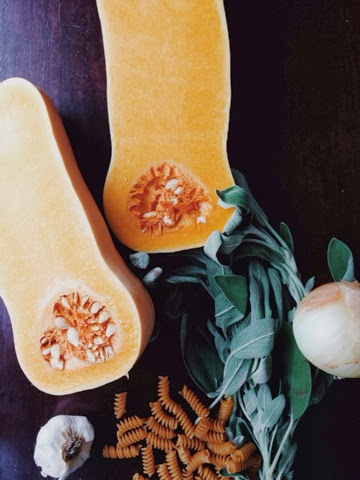 Clean and peel butternut squash, remove seeds. Dice squash and onion into 1 inch cubes. Mince garlic. Toss squash, onion and garlic with olive oil, salt and pepper. Roast for 35-40 minutes, until squash is tender and caramelized on all sides (wait until you smell this!). With 10 minutes or so left in squash roasting, boil pasta as directed on package label. Roughly chop sage. Add butter and sage to sautee pan over medium heat, and cook until you begin to hear crackling and butter turns a light shade of brown- almost toffee colored (do not burn butter, this happens quickly!) Remove from heat. 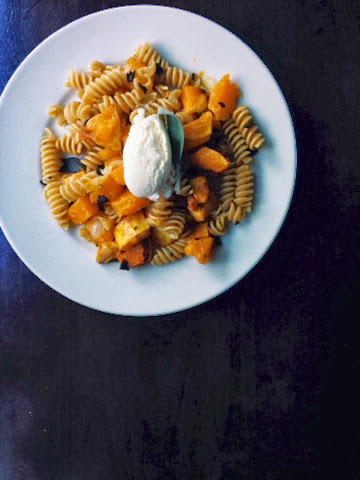 Toss hot, drained pasta with sage brown butter and roasted butternut squash, onion and garlic. Serve with a dollop of ricotta cheese. There aren't many times that my husband doesn't ask for meat with a meal. I'm all ears with butternut squash suggestions, especially dicing/peeling ones! Enjoy this first weekend in October! A good morning: we are all home together, I manage to sneak out of bed to catch the quiet peace of the sunrise and transform the last of our garden produce into something delicious for breakfast, while sipping some hot coffee. I love our days together. I often think of how wrong our society lives- we form a family of the people we love most, but spend little time together. We work away from home, school away from home, play away from home. My husband was raised on a dairy farm. 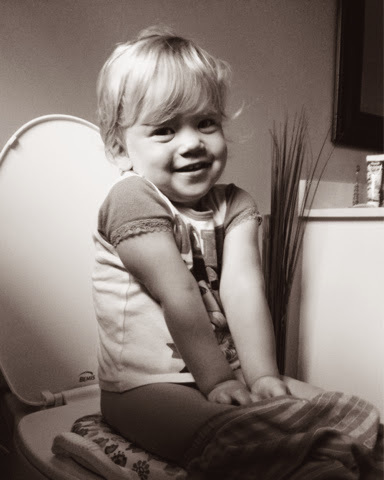 His family spent every day together. Woke with the sun, completed morning chores, gathered for breakfast and scheduled the remainder of their day- all together. He tells me what a blessing that was. He wants that for our family. I want that too. So today, we enjoy our time, until we can line up our goals and make a career together, at home. 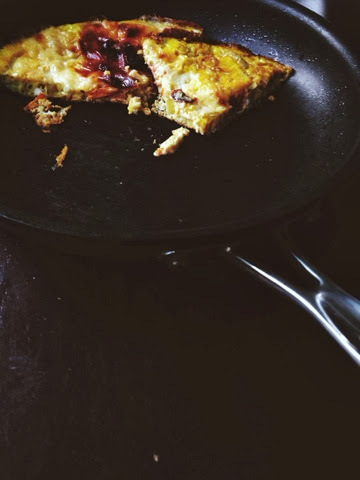 And this day begins with a frittata. Preheat oven to 400f. Preheat sautéed pan over medium heat, add olive oil and tomatoes, sautée until soft, approximately 5 minutes. Add garlic and cook until fragrant, about 1 minute. Whisk eggs and milk, pour on top if tomatoes and garlic. Cook until edges are firm, about 5 minutes. Sprinkle with mozzarella cheese. Place pan in oven and cook until cheese is browned and bubbly, approximately 10 minutes. Enjoy this dish with your family, and be sure to give thanks for your time together! I'm a huge fan of a relaxed weekend. Although we had a lot going on, we definitely made some quiet, family time for relaxation. This weekend began with my nephew, Noah's, 1st birthday party. My sister is a huge fan of parties, and Noah's 1st was no exception. I think 100 people joined for an organized soccer lesson for kids, pinata smacking, park playing, pizza and cake eating fun. Molly loved this party! 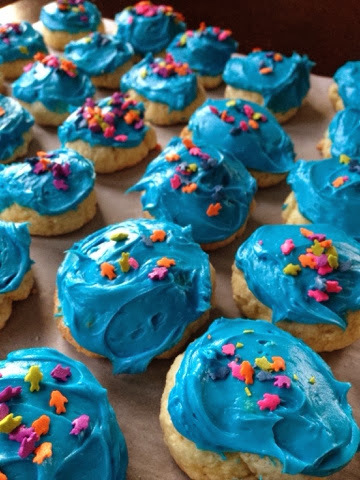 I was in charge of cookies, and resorted to the ever-popular family favorite recipe for buttermilk sugar cookies. Delicious as always. I love to cook, and I try to make delicious food that is also healthy. I've found some tricks to even fool my beef/meat loving husband. Molly and I mixed up some honey whole wheat pizza dough before mass, and after, we came home to make some pizza. 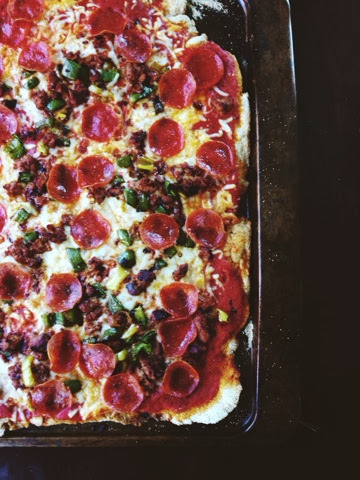 I used low-fat chicken sausage and turkey pepperoni, as well as some banana/italian sweet peppers from our garden with some fresh tomato sauce and part-skim mozzarella cheese to create a delicious, yet healthy pizza. It was a hit from all angles! 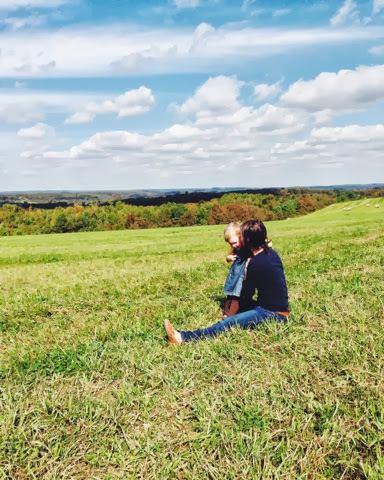 My husband's family owns and operates a dairy farm, so they have created some great relationships with local farmers through land leasing and just plain neighboring (although "neighbor" is a term I use loosely- their closest neighbor is about 1 mile from their farm). 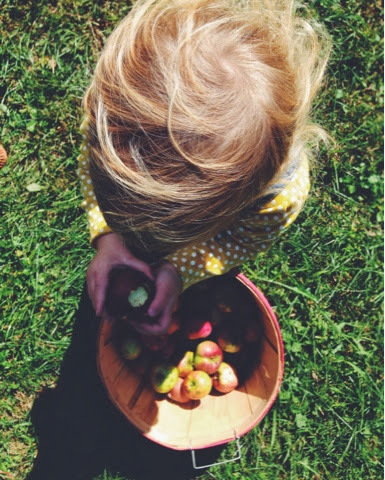 We were thrilled to pick apples in a neighbor's orchard this weekend. 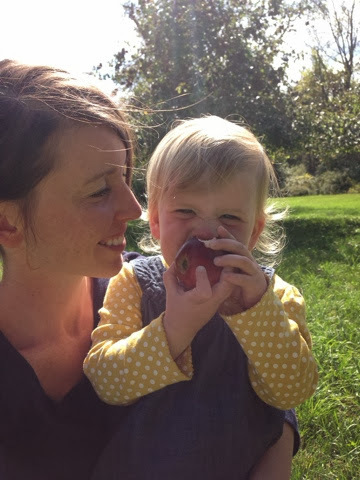 Molly is an apple fan, so this was quite an experience for her! 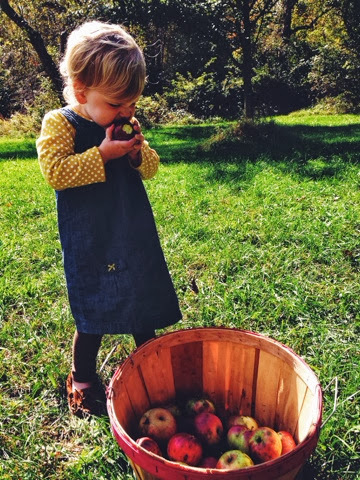 She took a bite of every apple she could get her hands on, and loved tasting the many varieties of apples. We picked about a bushel of different apple varieties, all for the fee of a quick visit (and I did offer some of our home-grown squash in trade). 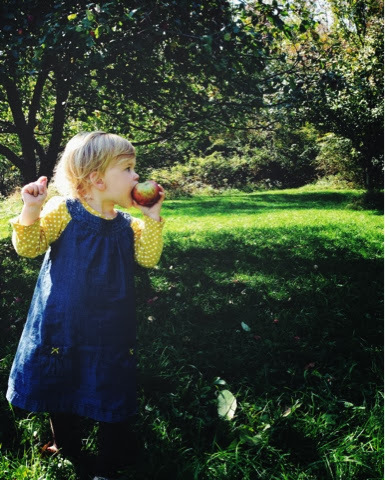 We even had access to an old-fashioned apple picker, making this a really fun experience! 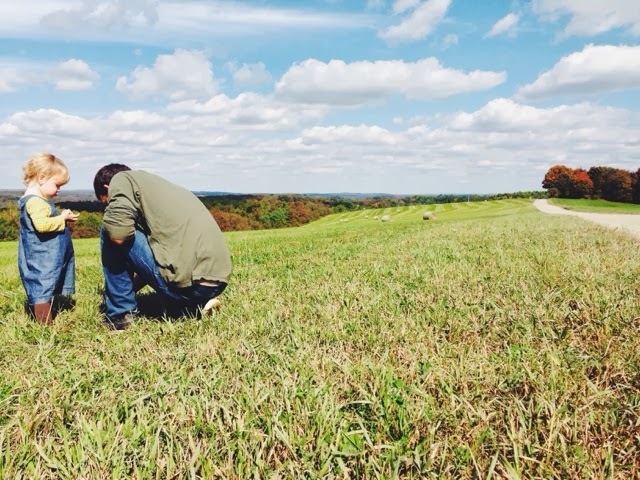 On our ride home, past an area that usually doesn't grab my attention, I made Jesse pull over to enjoy the view. I don't think I take time to thank God for this land, this beautiful part of the country we get to enjoy. We had a perfectly clear day. It was the first glimpse of changing leaves, just a week after the first day of Fall. We spent some time here showing Molly the sights and catching grasshoppers ;) I am constantly reminding myself to slow down and enjoy this. This child, my family, the changing season, the beauty of this land. It's really a beautiful gift from God, and I want to appreciate it. I want to teach Molly to appreciate it. I need to slow down.